The shapeshifter is one of the most misunderstood character archetypes. It is familiar while also shrouded in mystery. And you can find some in unexpected places. How about Kafka’s 1915 classic “The Metamorphosis”? In the novel, Gregor Samsa turns into a cockroach. That makes him a shapeshifter. Alright, I said it. Not a pretty sight. Not something out of Harry Potter. And yet, Kafka would have you look within and ask how close you are to the life of an insect. 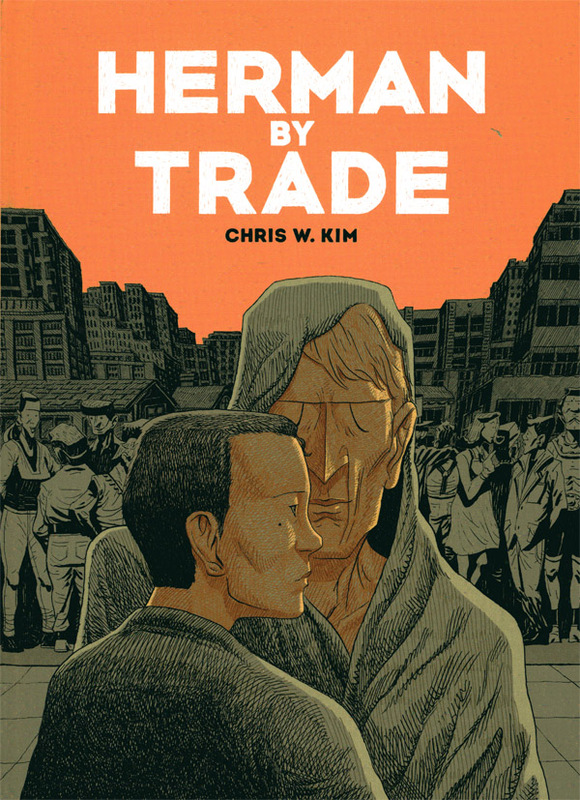 In Chris W. Kim’s new graphic novel, “Herman by Trade,” he takes a decidedly offbeat approach to shapeshifting. 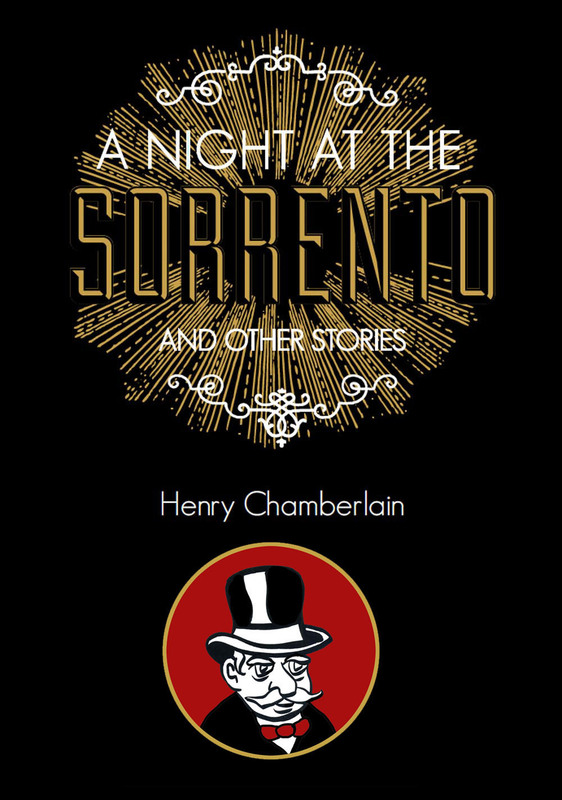 In the case of his main character, Herman, he emerges from a Kafka-like existence and is saved by his unique ability to shape shift. Kim begins with some spot on workplace satire that mirrors the bigger picture that lies ahead. Herman is part of a sanitation crew based at the city waterfront. Within the pecking order, Herman is viewed by his co-workers as a dowdy stay-at-home. But Herman has other plans when he goes to a special screening of a cult hit movie. He knows enough to go in costume. But he knows nothing about this celebrated film until he asks the girl at the ticket booth. She informs him that “Gare” is an intimate portrait of street performers. That’s good enough for Herman to join the die-hard fans in the crowded theater. With a light and subtle touch, Kim reveals Herman’s journey. It all begins that night in that movie theater. MIO, the film’s director, announces to wild applause that she is going to film a sequel to “Gare” and she invites anyone in the city to come audition at the waterfront. Herman’s fate is sealed. He must be part of the excitement of this momentous event. 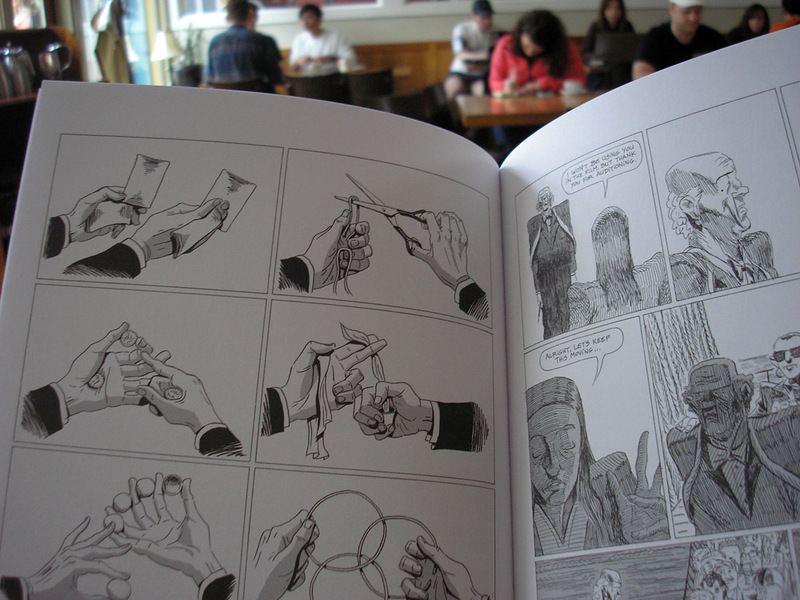 And, as this graphic novel unfolds, one can’t help but be captivated by Kim’s ambitious vision. He has the backstory of the film and its sequel; the mileu of film buffs; and Herman emerging from his inner world to a much more complex inner world. Herman’s goal to be cast in MIO’s new film turns out to be pretty daunting. How will Herman succeed while being so out of his element? In order to even survive, Herman must adapt and that involves shapshifting! Herman, despite all outward appearances, is no cockroach! Kim’s artwork is a marvelous mix of delicate and exuberant. He gently and slyly guides us. All the while, we are viewing not a roach, but a caterpillar emerging from its cocoon in order to triumphantly spread its butterfly wings. 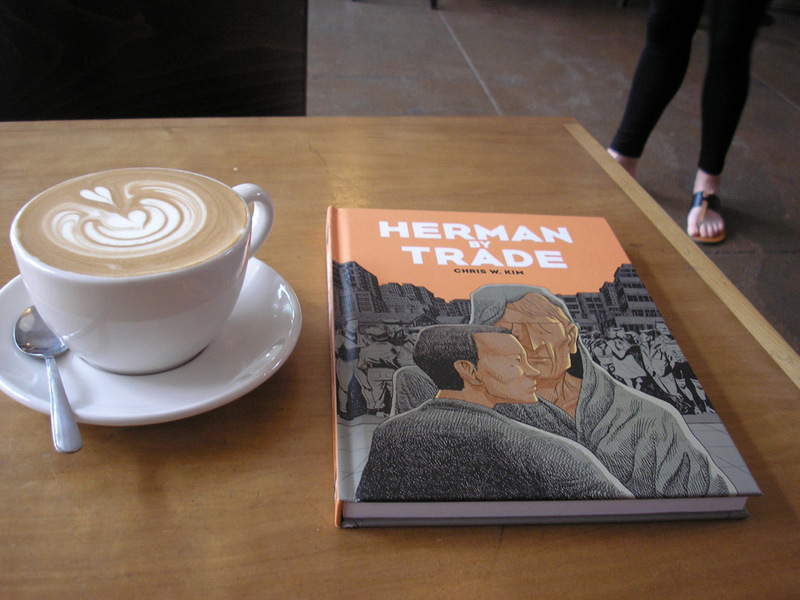 HERMAN BY TRADE is a 120-page hardcover, published by SelfMadeHero, an imprint of Abrams. For more details, visit Abrams right here. 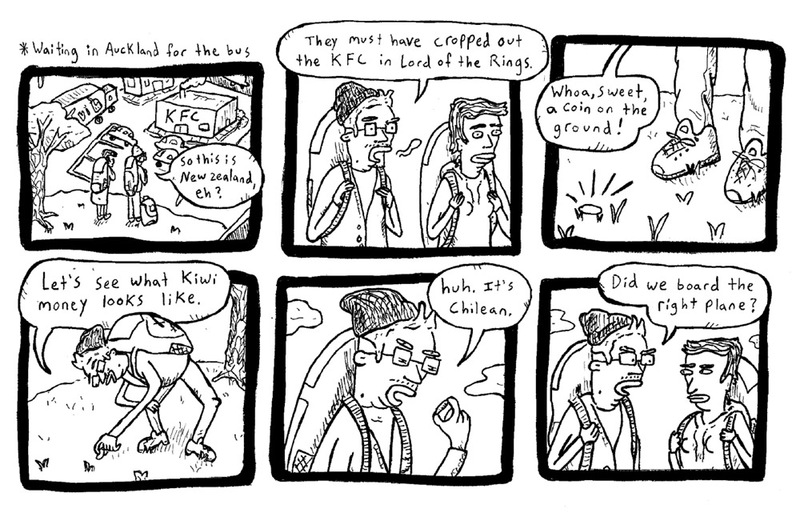 Wren McDonald is a cartoonist and illustrator. His illustrations appear in The New York Times, The New Yorker, GQ, The Washington Post, The Hollywood Reporter, and many other places. 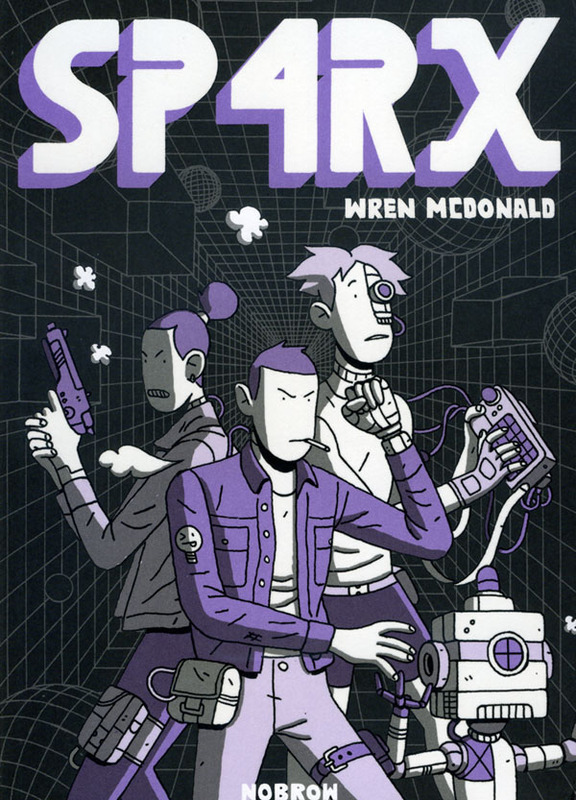 His first full-length graphic novel, a quirky cyberpunk thriller, “SP4RX,” was recently published by Nobrow Press. If you are in the New York City metro area this weekend, you can see Wren at Comic Arts Brooklyn. CAB is taking place this weekend with the main event this Saturday, November 5th, at Mt. Carmel Gymnasium, 12 Havemeyer Street, from 11am to 7pm, in beautiful Brooklyn! You can find Wren at CAB, downstairs at Table D31. Wren McDonald has shot like a rocket since graduating from Ringling College of Art and Design in 2013. 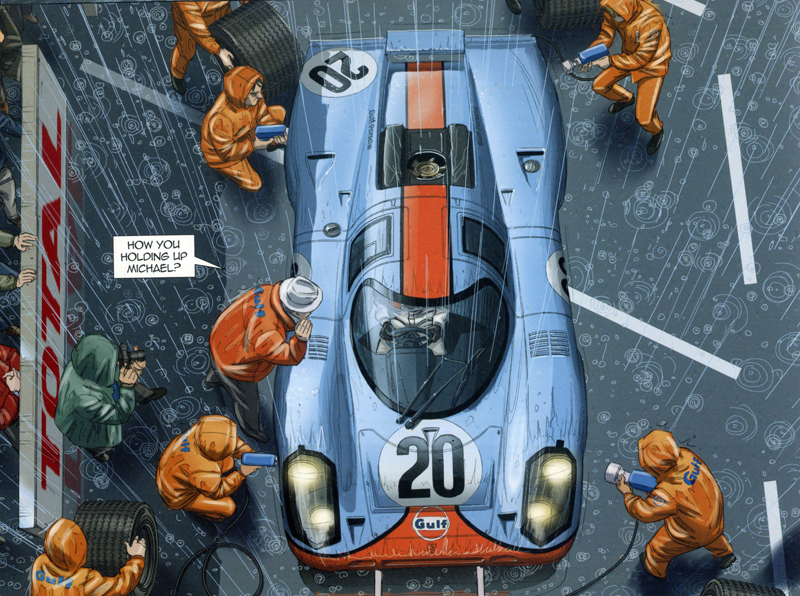 Wren has a refreshing take on both comics and illustrations: a rare set of skills, talent, passion, and drive. So, without further ado, here is my interview with Wren McDonald, recorded this Wednesday, as he prepares for Comic Arts Brooklyn. HENRY CHAMBERLAIN: Wren, if we were to do a virtual tour of your studio, what would we find there? That’s the set of circumstances for a lot of cartoonists and illustrators, isn’t it? Yeah, especially living in New York. It just doesn’t make much financial sense to have a separate studio. But I have plenty of room here. It’s pretty spacious. I can spread out and get my work done. I have a super big desk and an iMac. And I actually have (laughs) the extended studio in the living room! 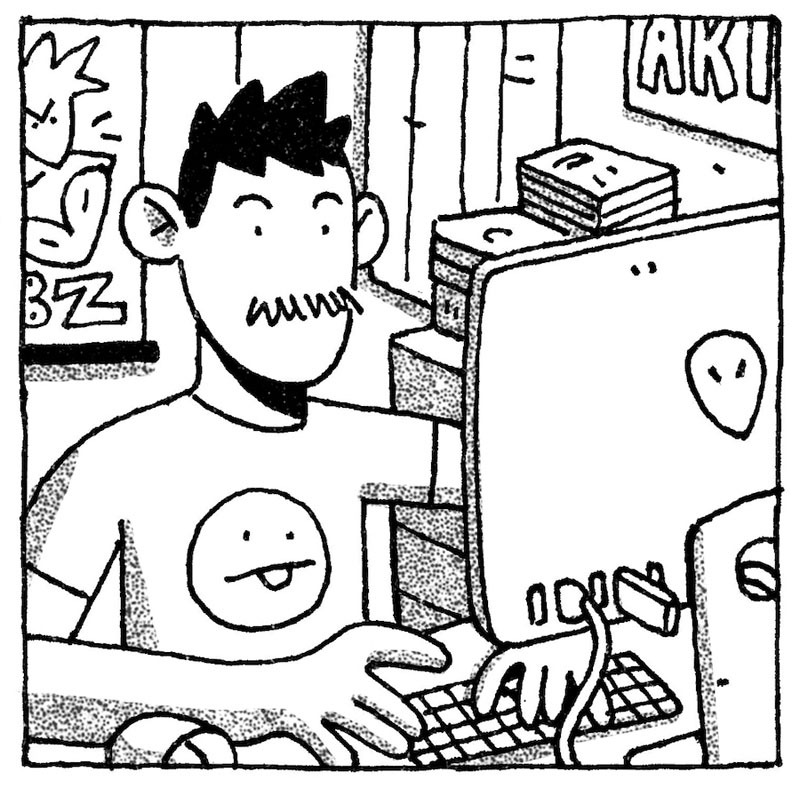 There I have a Lasergraph copier where I print out my mini-comics and zines. I direct folks who are new to your work to go to your website, wrenmcdonald.com. There you will find a cornucopia of stuff. 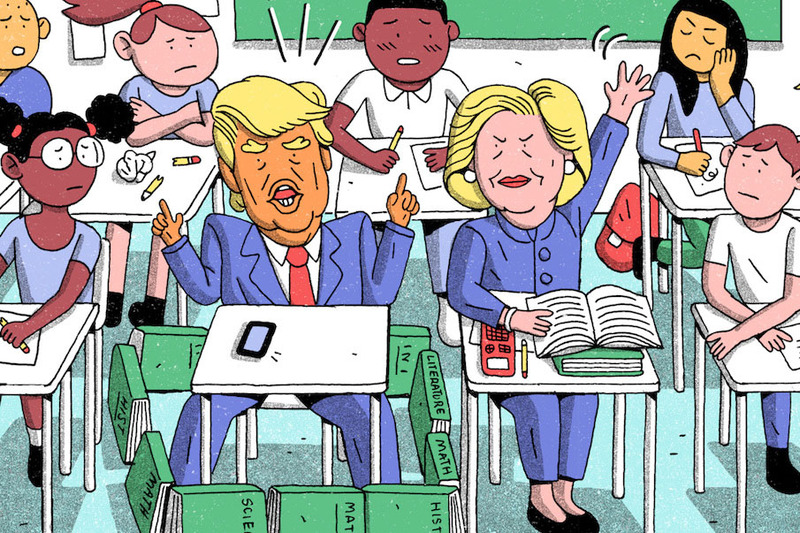 I’m focusing on one of your current illustrations of Trump and Clinton and they are both sitting in a classroom. These two are hyperreal, larger-than-life, cartoonish. You can’t make them up. Could you give us a window into how you created that illustration? That illustration was funny because I got the assignment the day before it was due, which was also the day before I was traveling to MICE Expo in Boston, a comics show that I was just at this last weekend. That was like a super rush job which was really intense. The art director at The New Yorker, Rina Kushnir, who is super great, I work with her a lot, she emailed me the article. She said it was last minute but she asked if I could do it. And I said, yes, of course. Rina needed sketches in the morning and then the final that evening, around 5pm or 6pm. So, that morning, I sent in like four sketches. They were sort of goofy and funny. Like you say, these candidates are already cartoony so it’s easy to characterize them. Rina chose the one she liked. That was at noon. From that point, I got to work on the final and sent it over in the evening. Those jobs are always pretty stressful but I enjoy doing them a lot because I feel that I work really hard and get a real day’s work in and have something to show for it. I wanted to ask you about your evolving into the illustrator you are today. Your work is appearing everywhere. Only a few years ago you were in Florida just starting out. Could you give us the cook’s tour of how you got where you are today. Sure, I graduated from Ringling College of Art and Design, which is in Sarasota, Florida, in 2013. When I was in school, I had a website and was posting things on social media, like Tumblr, and I think that helped me get my feet off the ground in terms of people seeing my work. From that point, I started going to comics shows like TCAF in Toronto, Comic Arts Brooklyn, and MoCCA. I tabled at TCAF and other shows I would just go to. I’d have mini-comics to give out to help make people aware of me. It’s two different paths, comics and illustration, so I’ll talk about them separately. The illustration stuff is, like I say, social media and tracking down email contacts and networking. And a lot of promotional stuff. You want to create a portfolio that really looks like editorial illustration. Editorial work has a snowball effect. You start to get jobs and you’re seen as a professional. The comics stuff is going to shows and socializing. I was approached by Peow! Studio, based in Sweden, about publishing one of my short stories in of one of their anthologies, “Time Capsule.” I thought that was super cool since I was familiar with their work. I was super excited. 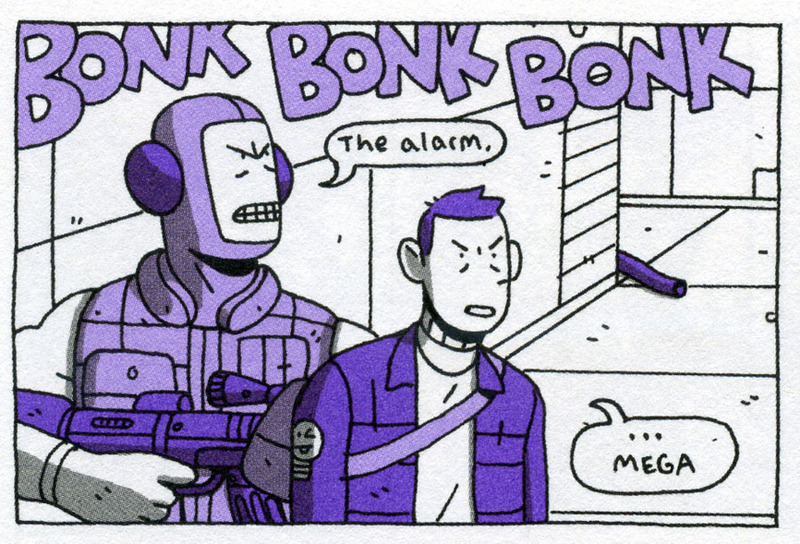 I think that was the first comics story that I had published out in the world besides my own stuff online, on Tumblr. 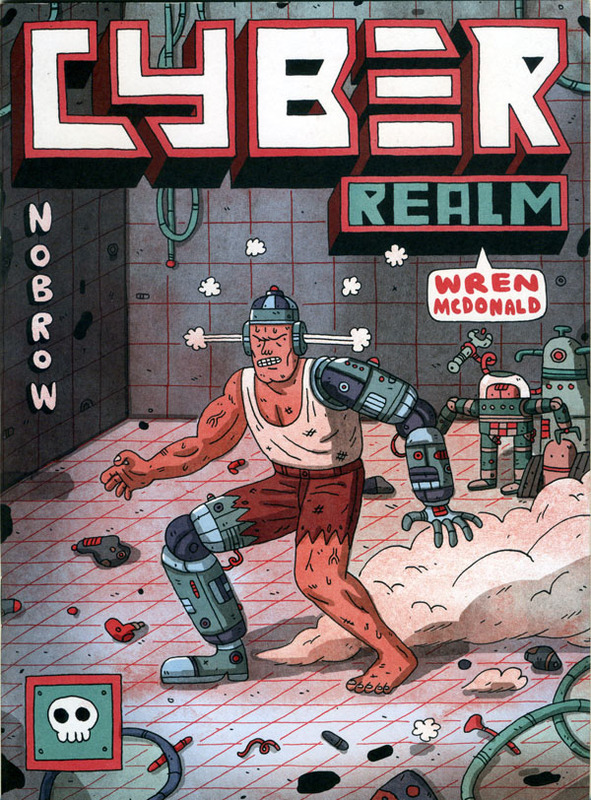 Soon after that, I talked to Nobrow about doing a short story (CYBER REALM) for their 17×23 series which is a platform to try out new talent. That’s a small format, just 24 pages. We did that and enjoyed working together. So, Nobrow said they wanted to try something longer. That’s what I wanted to do so it worked out that way. It’s amazing how quickly things came together. Did you already have an idea of what SP4RX was going to be like while you were working on CYBER REALM or did one work just follow the other? I didn’t have one story cocked and loaded beforehand. I always hear other cartoonists, or writers, when they talk about their work, saying they had this story they’d been working on since they were 10 years-old and it’s part of an epic world they’ve created. I’m not one of those people. When I sit down to write a story it’s about brainstorming and anything that peaks my interest. For SP4RX, I’ve always been interested in the cyberpunk genre, especially movies and comics. I wanted to work in that genre. I was already creating work dealing with technology, robots, and dystopian settings. I think it just made a lot of sense to me. We’re always hearing about the digital versus the physical. I direct people to the comic you did for The Comics Journal. How did that come about? I’m not sure if Nobrow contacted The Comics Journal, or the other way around, but The Comics Journal approached me about doing one of their A Cartoonist Diary columns. I was all for it since I have the attitude of wanting to try something out and make it work. I had not done diary comics before so I had to think about how to do this. Mine is not a traditional diary comic since it has these fantastical elements to it. Despite it being involved with things I was experiencing, the more apt title to it turned out to be “Not A Cartoonist Diary.” That was a fun project. 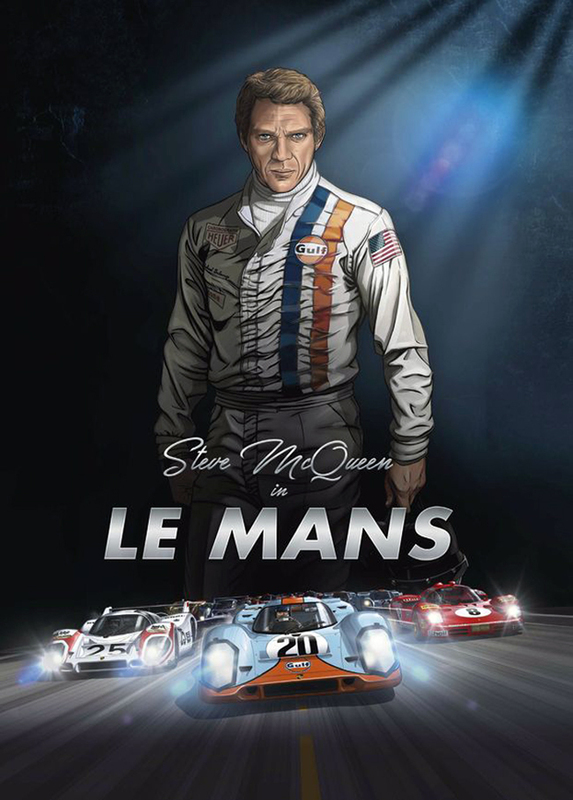 Over the years, illustration is deemed dead and then it comes right back. It all runs in cycles. You’re firmly in both the world of comics and illustrations. Some cartoonists, I know, have never printed mini-comics nor done the comic fest circuit. But you love that. Right! I love making comics, reading comics, and telling stories. I am passionate about my comics work because I am able to draw what I want to draw. Illustration is a fun back and forth since it involves work that I would not necessarily choose to draw: it’s more like a puzzle. Okay, how do I use these images to convey a specific idea, very concisely, to pair with the article? It’s a fun back and forth. Maybe I’ve been working on comics for two weeks straight, and then I get an editorial assignment. That’s great, I can take a break from comics and do an illustration, take a break from having my face too close to the page and switch my train of thought–and vice versa. If we were just chatting, we’d end up talking about books and movies, especially science fiction and cyberpunk. I imagine that “Videodrome” must be a favorite for you. I do love “Videodrome.” David Cronenberg is amazing but I don’t think that “Videodrome” had a specific influence on SP4RX. Instead, concerning SP4RX, I had just read William Gibson’s “Neuromancer,” which I thought was like the coolest book ever. It is considered “cool.” I wanted to make something “super cool” like that! I’d always been into “Akira” by Katsuhiro Otomo. And “Ghost in the Shell” by Masamune Shirow and his Appleseed series. And movies like Paul Verhoeven’s “Total Recall” or “Robocop.” Or James Cameron’s “Terminator II.” “The Matrix.” “Aliens.” Stuff like that. I wanted to do something in the vein of that genre. Let’s focus back on SP4RX: a super hacker going up against corporate enslavement. How close are we today to corporate enslavement? There’s a lot of parallels that I was drawing from. Basic stuff that I’d see on the news. Even just going about my day-to-day, going shopping or whatever, that would end up in SP4RX. It’s a world with hover cars and sci-fi elements but there are plenty of parallels to our real world throughout. For example, I’d be watching some crazy video on YouTube with one newscaster harassing another newscaster and I would basically copy and paste that into the book. Within a sci-fi setting, you can focus on the human element. You don’t get caught up in a specific nation or political agenda. It’s just people in this science fiction world. Everyone may not get a hover car but we’ve got plenty of the weird and nefarious stuff already. What do you think about Edward Snowden and us being monitored? The future is here. Yeah, it makes me think that the cyberpunk genre and movement is more relevant than ever. When the internet was first coming about, that genre seemed so cheesy. It’s fun to laugh about it but there’s so much of it that’s relevant. Like you say, that NSA stuff is really happening. It’s important to pay attention to that and be aware. Is there anything you’d like folks to know about that you are currently doing? It depends upon when you think this post will go up. There’s Comic Arts Brooklyn this weekend. Oh, yeah, that movie has a nice sci-fi cheesy quality. 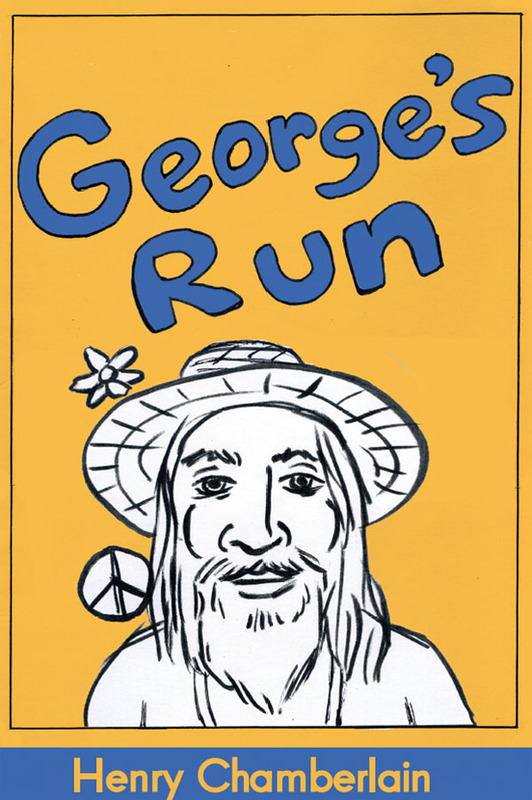 Well, the thing with George was that he kept to his set of values and the integrity of his storytelling. “Logan’s Run” is an example of a big studio having its own ideas on what the story should be. It’s totally fun though and I think a remake would be great. The original novel is very different. I think you’d enjoy it. But getting back to CAB. Yes, I will be at Comic Arts Brooklyn this Saturday, November 5th. You can find me downstairs at Table D31. So, come by and say hello! And I have a new mini-comic that will debut at CAB and then be available on my site which is called, “Dirt Dart,” a 12-page story about a soldier lost on another planet. Well, it’s been fun talking with you, Wren. I know that you’re having the time of your life. Thank you, Henry. When you’re in New York, stop by and we can have a drink. SP4RX is out now. 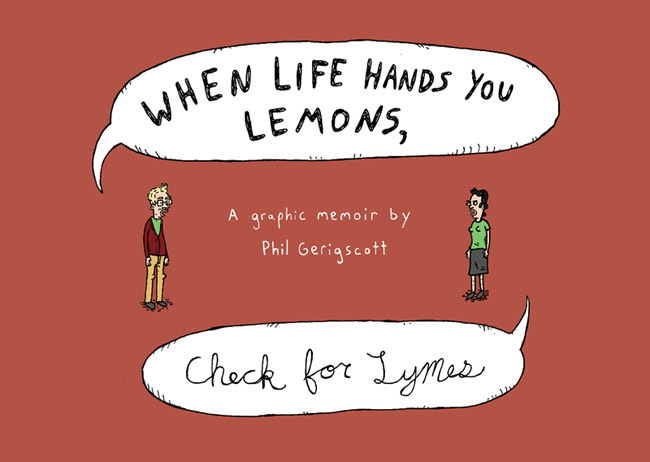 Find it at Nobrow Press right here. Visit Wren McDonald right here. 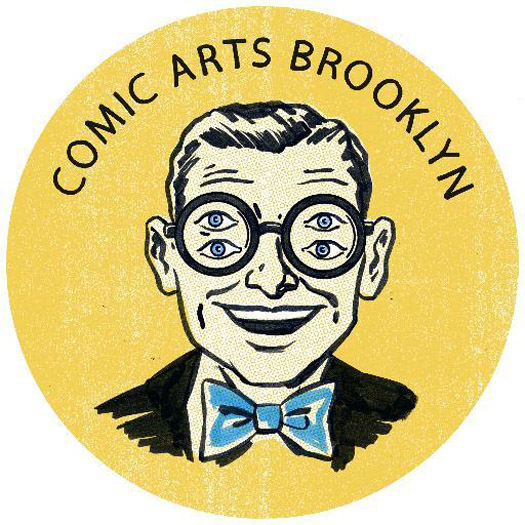 And, if you are in the New York City metro area, be sure to visit Comic Arts Brooklyn this weekend. Visit CAB right here. 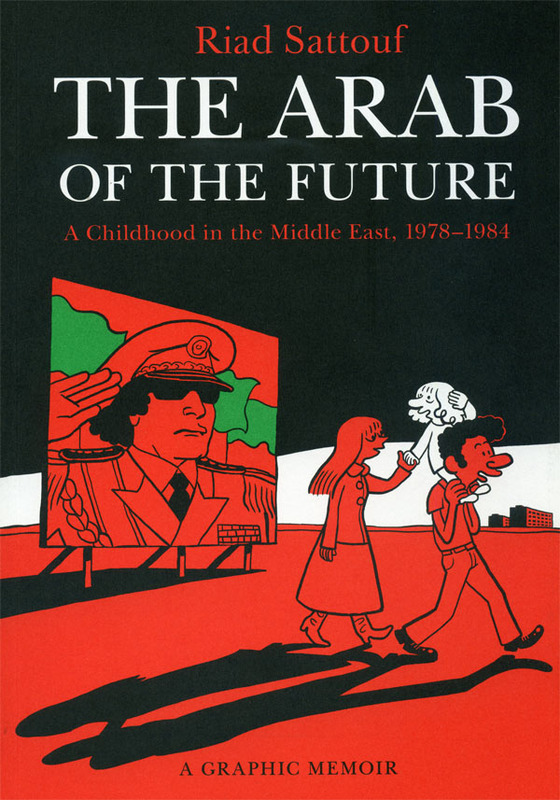 “The Arab of the Future: A Childhood in the Middle East, 1978-1984: A Graphic Memoir,” by Riad Sattouf, is a must-read for anyone interested in a story that helps to illuminate the ongoing conflict in the Middle East. As I was preparing this review this weekend, Saudi Arabia cut diplomatic ties with Iran over events that heated the tension between the Sunni majority and the Shitte minority. Brought down to an intimate level, in the spirit of Marjane Satrapi’s “Persepolis,” Sattouf’s graphic novel takes us into a part of the world many of us would like to understand better. Riad Sattouf provides us with a amazing tale spanning his earliest years, from birth up to age six, in this first part to his memoirs. Told from a child’s point of view, it is eye-opening and honest. But it’s also told from a no-holds-barred adult’s point of view. Sattouf was a contributor to the controversial satirical publication, Charlie Hebdo. What this extended narrative helps to do is give some insight into a certain way of seeing and a certain sense of humor that may challenge readers the further away they are from the scene. Sattouf is in a unique position to undertake such a work having been born into a family with a Syrian father and a French mother. No doubt, this is not a sentimental journey. And, while it is educational, this is not suitable for children. I’d say late teens on up. Above all, this is a fascinating story with a whimsical and surprising energy. We follow little Riad literally from his earliest days as a cute towhead frolicking in innocence. And, little by little, we see that innocence chipped away. Sattouf depicts his father as both bookish/academic and crude/uncouth. His mother he depicts as refined but ultimately subservient to her husband. And Sattouf cannot help but dwell on the backwardness and the darkness he believes he may have witnessed in the Middle East at such a young age. He regularly describes the Arabs he comes in contact with in terms of the sweat he smells from them. While that is more of the child’s-eye at play, it speaks to a special tension the author is dealing with. 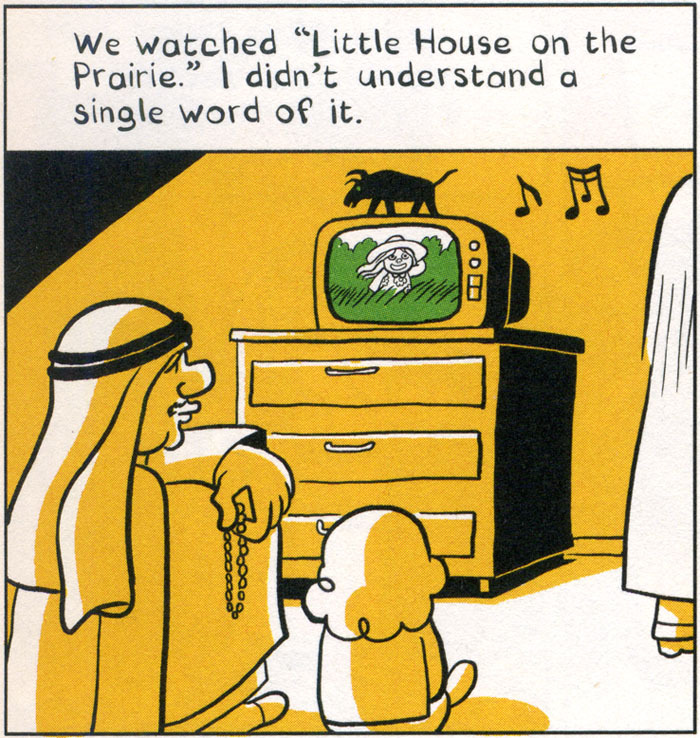 Sattouf sees himself, like Marjane Satrapi, as an ultimate outsider. As the book’s title ironically states, it is little Riad who is in conflict with the idea of being the Arab of the future. Aside from the portrait of young Riad, the portraits of Libya under Gaddafi and Syria under Assad are quite interesting. We get a firsthand look at Gaddafi’s attempt at creating a utopia with free housing for everyone. There’s only one catch: you can’t lock your home. So, if someone else comes by in need of a home, and you’re not around, they can take it over. Assad’s Syria, during a relatively peaceful time, looks like a war zone. Sattouf’s father, full of idealism and for his own selfish reasons, brings his family to live in very challenging conditions in Libya and Syria. To make it worse, Sattouf would be moved back and forth so he had life in Paris to factor in as well. It was to be a life layered in conflict on many levels. 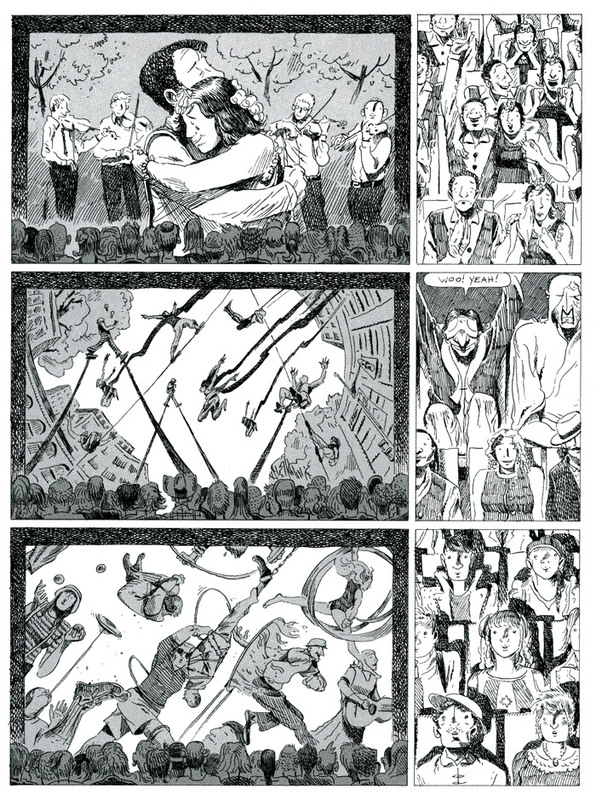 Which brings us back to Sattouf’s connection with Charlie Hebdo and its controversy and tragedy. 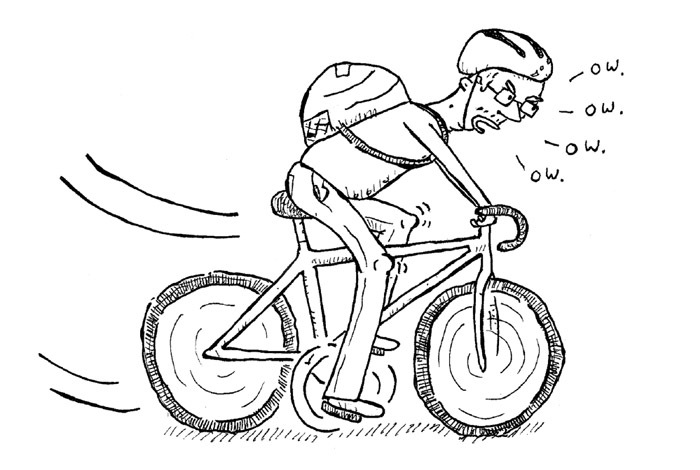 The biggest problem that a provocative one panel gag cartoon has is that it is a provocative one panel gag cartoon. However, with a graphic novel, you have a much better chance to deal with a myriad of thoughts and emotions running a lifetime, running generations. So, yes, this book will provoke. You should know that. But it is definitely worth reading. “The Arab of the Future: A Graphic Memoir” is a 160-page trade paperback published by Metropolitan Books, an imprint of Henry Holt. For more details, visit the book’s site right here. Christian Dior at work on a new collection at his country house. Annie Goetzinger has quite a light touch to her drawings that manage to speak volumes. It is one thing to draw pretty women in chic settings and quite another to convey the humanity and complexity behind the story. 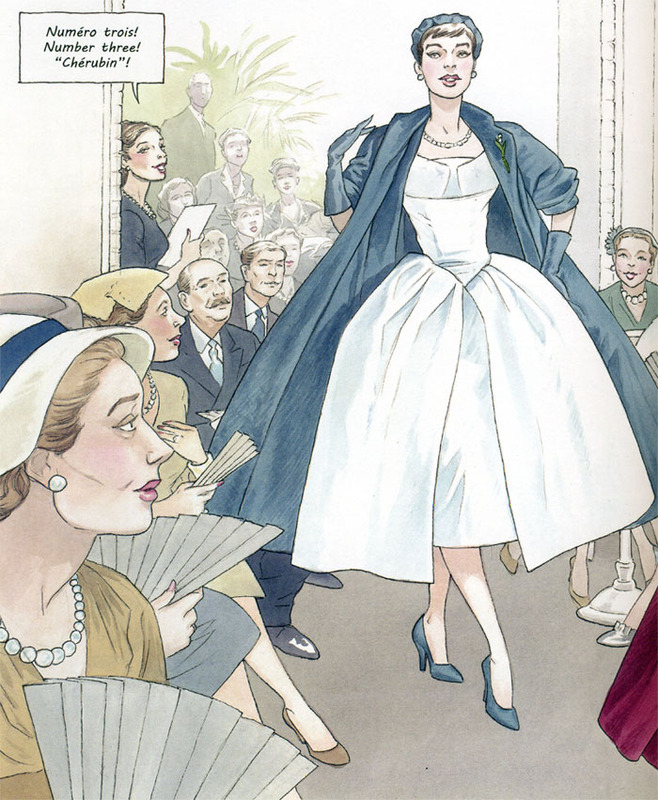 Goetzinger’s graphic novel, “Girl in Dior,” does just that with her behind-the-scenes look at the life and work of legendary fashion designer Christian Dior. The House of Dior, at 30 Avenue Montaigne, was meant to evoke a cross between Louis XVI and the dawn of the 20th Century. It was to be made up of white paneling, pearl gray satin, taffeta lampshades, and discretely placed bouquets and kentia palms. It was not based upon anyone’s reality but upon Dior’s own childhood daydreams. It was to be the perfect place, the epicenter for high fashion, beginning with the first Dior fashion show for the Spring-Summer collection for 1947. Amid the refined mayhem that ensues, we meet our main character, Clara Nohant, a budding fashion columnist. It is through the fictional Clara that we can savor certain key moments and get a sense of the world of Dior. 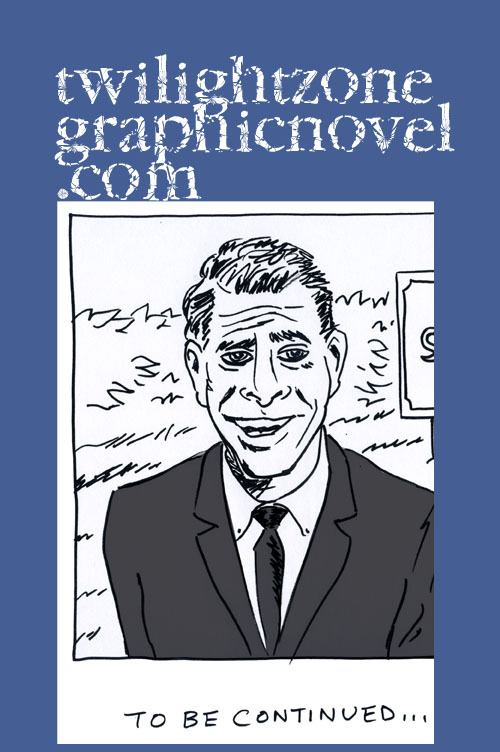 As only a graphic novel can offer, we can get very specific upon what you view and linger upon. In the right hands, this results in such a masterpiece as this. 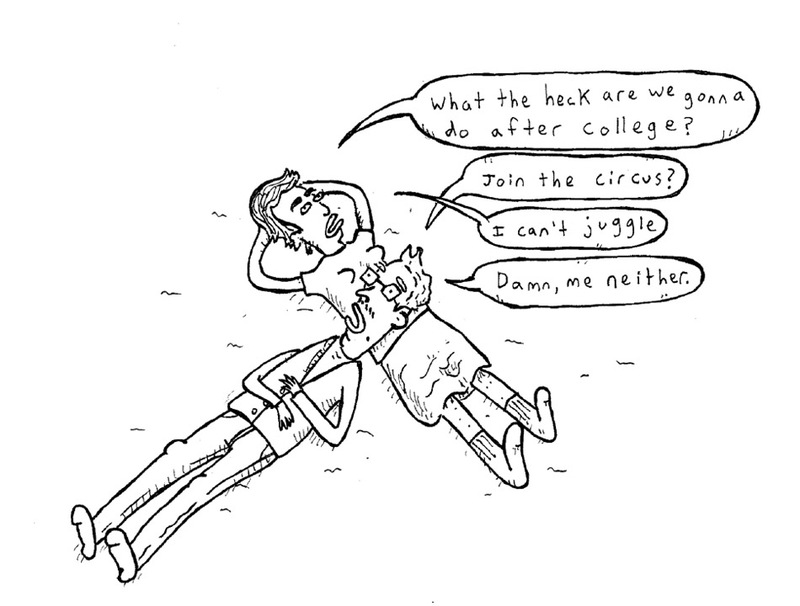 Goetzinger is a master cartoonist. She well knows that she cannot show you every last detail. Instead, she must pick and choose. She spends a good portion of time simply reveling in that special moment that was the launch of the House of Dior. After all, it sent shockwaves throughout the fashion world and led women, around the world, to consider lowering their hemlines. Having given the reader a solid grounding on that event, she quickens the pace. Clara goes from one major blunder to landing herself the role as the latest model to join the Dior inner circle. This book is a delight to read through and through. Some books you keep, and this one is a keeper. The art is stunning in how it works within the confines of elegant refinement. 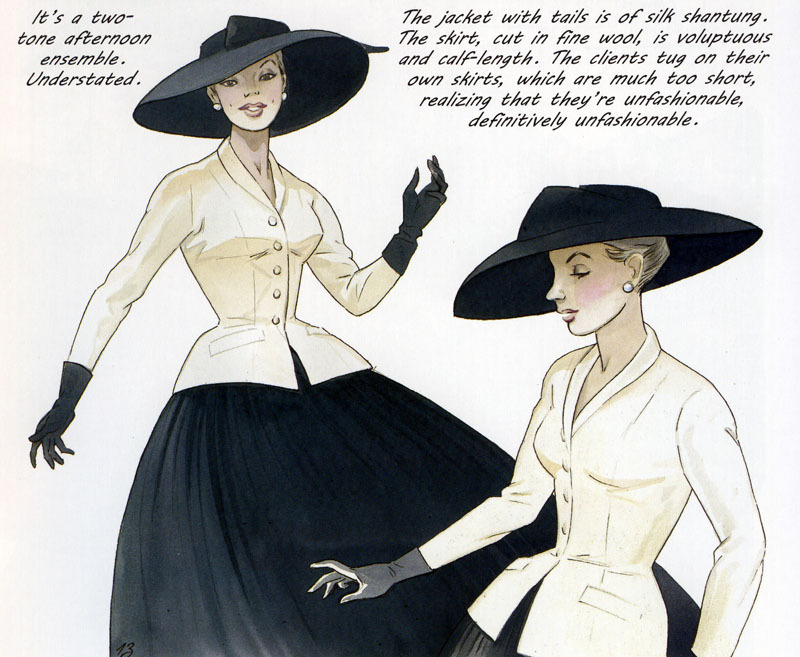 Goetzinger’s background in fashion illustration serves her well as she effortlessly captures the flow of fabric and the carriage and grace of the models. And her stylish line is complimented by her gorgeous use of watercolor. In her hands, the fashion world, while always cool and detached, never goes cold. In the end, there’s a warm human touch to this tale of high fashion. “Girl in Dior” is a 128-page full color hardcover, priced at $27.99, published by NBM Publishing. For more details, visit our friends at NBM right here. 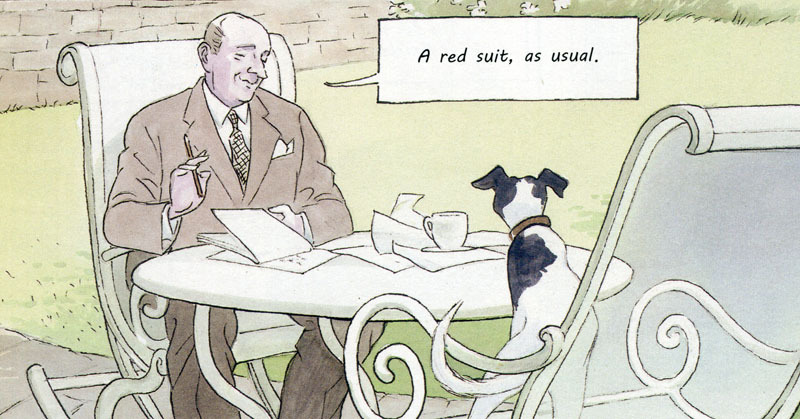 Memoir, non-fiction and biography have emerged as significant categories in comics. 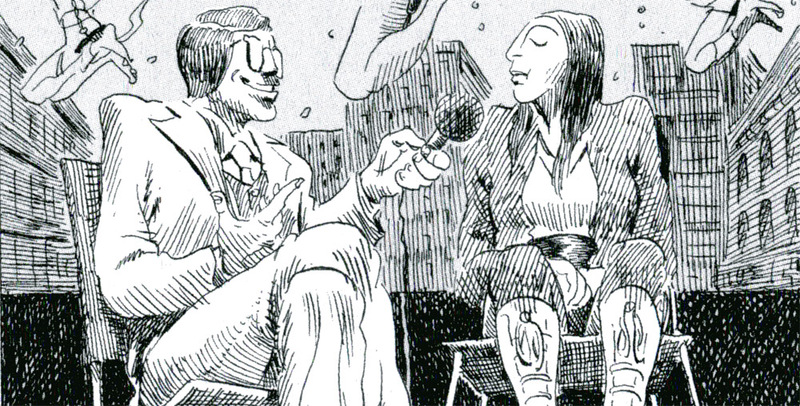 Comics about artists represent a special challenge: the cartoonist must represent the work of an artist through his or her own visual approach, revealing points of disjunction and harmony. Hyperallergic Senior Editor Jillian Steinhauer will discuss these issues with French comics legend Annie Goetzinger, whose Girl in Dior chronicles the first season of the storied fashion house; James Romberger and Marguerite Van Cook, whose 7 Miles a Second was both a biography of and a collaboration with David Wojnarowicz; and Dutch cartoonist Barbara Stok, whose Vincent makes Van Gogh approachable through a style completely unlike his own. For more details on the MoCCA Arts Festival, go here. 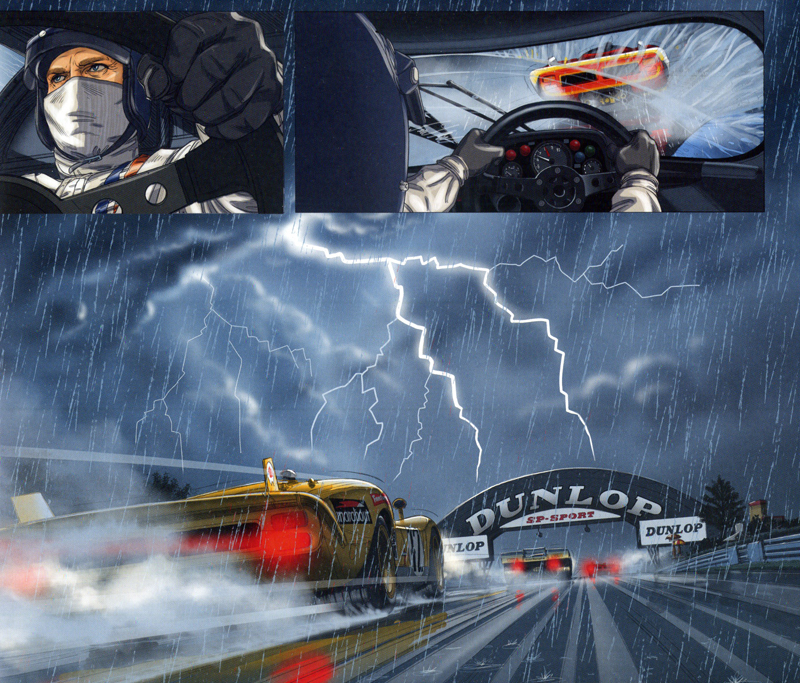 Denis St. John is just the sort of cartoonist it is a pleasure to champion. Here’s the thing, there are many, many, many cartoonists who deserve a thoughtful review, especially early in their careers as they are working towards establishing themselves. I support art for art’s sake but I’m most interested in cartoonists creating ambitious work on some level. It doesn’t come down just to issues of craft and narrative. It comes down to issues of vision. Overall, the comic can have a shaggy dog quality to it but if it has that spark, then let that shaggy dog howl! And that’s what we have here with this collection of horror comics, “Amelia: A Monsters & Girls Book.” I say more power to Denis St. John! Daniel Stope is a well-intentioned young man from the country who has dreams of becoming a professional artist. Of course, one of the best places to foster, as well as dash, such ambitions is going to an art school. In can be honey or vinegar, depending upon numerous factors. Jamie Coe explores the honey and vinegar of art school in his debut graphic novel, “Art Schooled,” published by Nobrow Press.